The registry is an incredibly important component of Windows and whether you are using a tweaking tool to do the hard work for you or you are editing the registry by hand, it is important that you have a backup in place in case anything should go wrong. Registry Backup Portable is a tool that can be used to manually or automatically backup your registry so it can be restored if needed. The tool can be used to back up the registry as a whole, or you can choose to only back up the hives and branches you are going to be working with. The actual backup process is very quick and simple, and the same can be said of the restoration procedure. 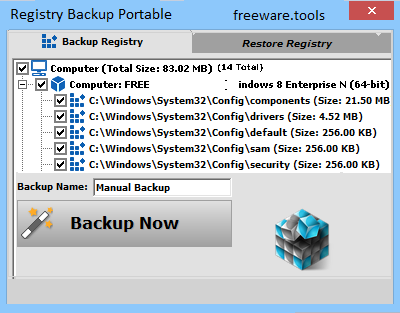 This is the portable version of Tweaking.com - Registry Backup, a feature-rich software application that comes bundled with intuitive and useful options for backing up the Windows Registry, more efficient than using Registry Editor's built-in settings. Backing up the registry is important for resolving system errors that occur due to faulty entries, in a sense that restoring keys to their default values is possible to cancel such events. Since there is no setup pack involved, you can save the app files in any location on the computer and run the EXE file directly, as well as copy them to a pen drive to be able to use Registry Backup on any workstation, without prior installers. The advantage of portable apps is that they do not add new entries to the Windows registry, nor (usually) create new files on the HDD without the user's approval, thus leaving it clean after removal. The program is wrapped in a user-friendly interface, made from a window split into multiple areas. A list is populated with all current registry entries at startup, and allows you to select only specific keys for backup, instead of everything. Editing the file name is suffice to start the backup procedure. From the "Settings" panel you can change the saving directory, set the app to automatically delete old backups (user-defined time frame). Also, schedule tasks via Windows' built-in feature ("Task Scheduler"), select their display mode (hidden, minimized, normal, show tray icon), and choose the account to run them under (current user, system). Registry Backup offers support for Volume Shadow Copy, which basically enables data snapshots even if they have a lock (i.e. currently used information). In case the task takes too long when using this feature, users may resort to the fallback backup method. In order to restore a backup, all you have to do is point it out. The program has minimal impact on computer performance, running on very low CPU and RAM. It is very responsive to commands and takes a reasonable amount of time to carry out a backup job. To sum it up, Tweaking.com - Registry Backup Portable supplies users with a simple method for backing up and restoring the Windows Registry, accompanied by powerful features.